Samples of original sea glass jewelry made by Lin Schneider and Signe Lawson using sterling silver, gold-filled, copper, or brass wire to wrap unique jewelry creations for you. ...to wrap, bezel, and forge unique and original jewelry creations for you. Lin has years of experience making custom jewelry and displays her sea glass jewelry in galleries on the East and West Coast of the United States. Pendant Overall Size: 2-1/4 inch x 1/2 inch. 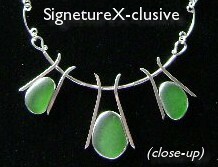 Signe brings the fresh and breezy contemporary look to her original, one-of-a-kind sea glass necklaces and sets. What do these necklaces have in common? First, of course, that they're all made of genuine sea glass. 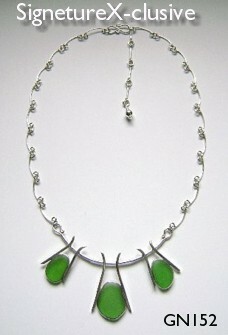 Secondly, they're all in the category of recycled or upcycled jewelry - environmentally-friendly jewelry pieces. 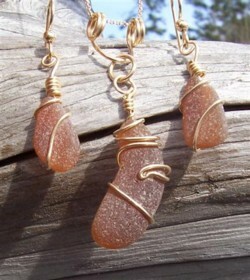 Thirdly, since they're all original sea glass necklace designs, no two are ever alike!